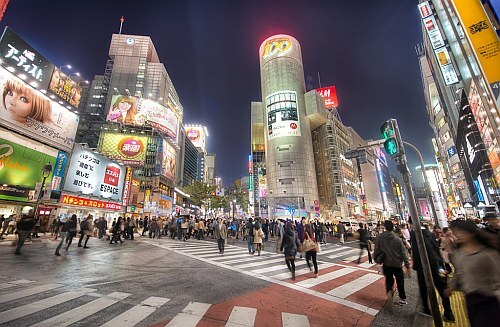 All Nippon Airways (ANA) has dropped the price of their non-stop flights from Vancouver to Tokyo, Japan down to $620 CAD roundtrip including taxes. The flights are in and out of Tokyo's Haneda airport (HND) - the one that's close to downtown Tokyo. ANA was ranked #3 worldwide in this year's airline rankings. You can also find 1-stop flights from Victoria (YYJ) to Tokyo (HND) on the same dates for $636 CAD roundtrip. You may also be able to find 1-stop flights from Vancouver (YVR) to Osaka, Japan (KIX) for around $652 CAD roundtrip. You can also find flights where you fly non-stop to Tokyo, and then home from Osaka (1 stop), for $649 CAD including taxes. 2. Click on the departure date box to open up the calendar view and look for the date combinations that are $927 roundtrip. NOTE: In May and June look for the dates that are $1,113 roundtrip. 1. First you may want to try finding a normal roundtrip flight to Tokyo, using the instructions above. Note the dates. ^^ $649 flights, flight between Tokyo and Osaka is not included. ^^ $674 flights, flight between Tokyo and Osaka is included. 4. As for the dates to use, try using start and end dates that are the same as the regular roundtrip flight to Tokyo you found in Step 1. You may have noticed that the only booking sites showing these fares are ones that are generally considered the lower quality booking sites (BookAirfare, Airfare Network). I would consider Budget Air to be more of mid-level quality, and probably the best of the booking sites I've seen with this fare. If you try Googling for reviews, you'll probably find a lot of bad reviews. Although the same can be said for even the higher quality booking sites of the world (Expedia, Priceline, etc). It's the nature of booking sites to attract bad reviews. The reason the lower quality booking sites often have the worst reviews, is usually because they tend to use the lowest quality off-shore customer support service. - It's not super unusual for the low quality booking sites to be the only ones offering a really cheap price on ANA flights. Or for them to offer a price that is significantly cheaper than the ANA website. I've seen this many times over the years. - With pretty much every ANA deal I can think of, once you book through the low quality booking site, you are issued a ticket number by ANA. You can use this ticket number to check your booking directly on the ANA website and make sure all is well. In that sense, booking a ticket through a low quality booking site is the same as booking your ticket with ANA. The booking site is just the middle man, getting ANA to issue that ticket on your behalf. It's the same ticket, and you're in the same airline reservation systems worldwide. Assuming you never need to make any changes to your ticket, you shouldn't have to deal with the booking site from that point on. However, the key difference between booking through a third party booking site and the airline directly is that if you ever need to deal with customer support (make changes, cancel your ticket, etc) you are forced to deal with the customer service of the third party booking site. And as mentioned above, generally speaking, the lower the quality of the booking site, the greater the chance that the customer service experience, if ever needed, would be a bad one. Update: It looks like Budget Air is quick at getting these tickets issued from ANA. AirfareNetwork is not as quick. Update 11/22 @ 1:00 PM PST - It looks like these are all gone. vancouver, yvr, flight deals, asia, east asia, tokyo, japan, hnd, osaka, ana, kix and all nippon airways. 25 Responses to "Vancouver to Tokyo, Japan - $620 CAD roundtrip including taxes | non-stop flights on ANA"
hey chris how come skyscanner is able to offer a much lower rate than ana for the same flight? I can't get this to work- I'm only getting flights with a 15 hr layover in San Fran, and they are $700+. Anyone having success? Which dates are you trying? I'm currently seeing this work on all kinds of dates, but if certain dates sell out of tickets, it can affect what you see. Sometimes airlines offer prices to certain travel agencies or booking sites that are lower than what can be found on the airline's website. Sometimes the discount is just a small one, but ANA is one that I occasionally see offering a big discount through certain booking sites. Have any of you guys used BookAirfare.com? I am just a little worried given all the negative reviews I see but some people seem to have positive experiences. has anyone had any luck? Haven't seen any of these prices. Which dates are you trying Kayla? This sounds like a great deal, but it's taking me through "bookairfare.com" when I try to buy, which I've never used, and is getting a lot of "danger, scammer!" reviews when I web search it. Has anyone used this site? I want to book, but no other sites are finding near the same price so I'm suspicious. I see mine through BudgetAir another hit and miss booking site. How is it again that certain booking sights secure this level of pricing vs ANA's site (if as you say above ANA has done the price drop)? Thanks for a cool Vancouver based site by the way. Also, in answer to Kayla and anon, I couldn't get those prices if I went too far into April, but I found $620-660 in Feb and March. Some of them have a 2 hr stopover in San Fran on the way, but no big deal. Eg. Mar 8-Apr 5, Mar 1-28, etc. I'm wondering if airfare network is a site people have experience with booking through? Booked with Fareboom for $680 in early April. YVR to HND. ITM return to YVR. Wife is pleased! Got the ANA reservation number at 7am PST (and credit card charged by ANA). Checked on ANA website and details as booked. Thanks for the info Jonathan. Sounds like AirfareNetwork is slower at getting them ticketed from ANA than BudgetAir, which is usually the case for the lower level booking sites. I tried looking in June with the $1113 prices and no luck on Skyskanner...it was cheaper but still around $1000. Yep, it looks like these are gone, for all months. I managed to get two tickets from Vancouver to Tokyo for $661 each yesterday via FareGeek. Glad we jumped on this one yesterday, otherwise would have missed out. Thanks Chris!!!! No problem Trevor! Do you happen to know how long it was between the time you booked, and when you received the tickets ? Just curious as to how quick FareGeek was compared to the others. I also got Vancouver - Tokyo, Osaka - Vancouver from FareGeek for $650. I was worried about booking through FareGeek but got my ticket about 3.5 hrs after receiving a confirmation email around 1am on 22nd. Thank you Chris for the deal and the posting on third-party booking sites! Thanks for the info Liz, glad to hear FareGeek was fairly quick. Have a great time in Japan everyone! The time difference was only 71 minutes. On FareGeek I was able to choose my seats on both legs of the trip. I logged into the ANA website with the confirmation code, and could view my tickets and was able to update my passport information. I input the same dates into the ANA site this morning, and the cheapest I could get was $961. I therefore saved $300 buying the tickets last Tuesday!